That “Tiffany blue” sells. Regardless of the item, Tiffany & Co. items draw bids. So always be sure to display the aqua box or bag. My post this week is about your silent auction tables and the BEST color to put on them. It seems to be everyone’s favorite color. And it’s a perfect time for me to share this insight, as next week is Valentine’s Day, which is a popular holiday for the giving of jewelry. My observation is that after finding the bar at your gala (and munching on an hors d’oeuvres or two), one of the first items to receive a bid in your silent auction will be something displayed with a Tiffany blue box or bag sitting next to it. Guests will find this aqua color, even if it’s on the 5th floor of your 2-story venue. It could be one box no bigger than a ring case. It could be sitting in the darkest corner of your silent auction section. It could be tucked into an enclave far removed from every other silent auction item. It doesn’t matter where you put that item — or to a large degree, what the item is. 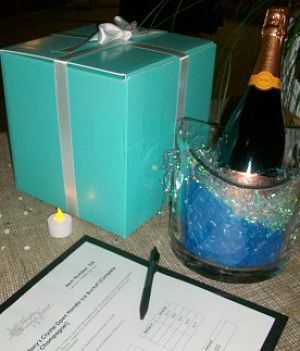 If it’s got that aqua blue box sitting next to a bid sheet, your guests will find it and bid on it. Tiffany & Co. has done a fabulous job marketing the company. Its trademark color is synonymous with quality and taste. So although good silent auction marketing practices dictate that you DO display the item, it’s that trademark color which attracts bidders. In this case, the item is of secondary importance. 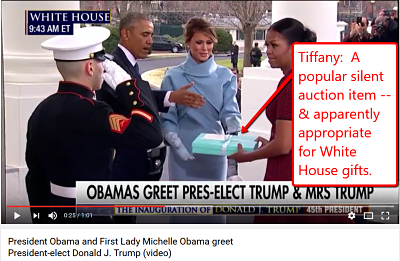 It’s JUST AS important to display the Tiffany box or bag as it is to display the item! Put them both out on your silent auction table. In my small town in Tennessee, I’m not sure how many people would recognize that Tiffany’s color. But I completely agree with the concept – display the box or bag if it has name recognition. I was at an event last night with a silent auction and there were several things that immediately caught my eye – they all had the bright University of Tennessee orange. Clearly others did too, as those items received lots of bids! Keep the good tips coming Sherry! Excellent point, Sandy. Maybe the color chosen depends on your location. Tiffany — still apropos for gifts in 2017.